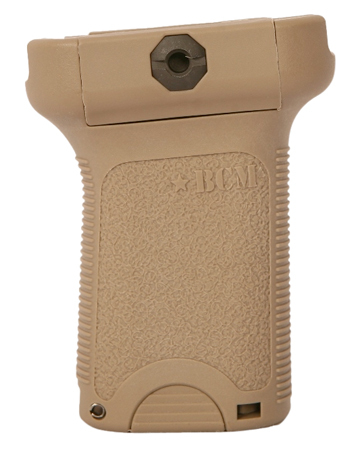 This vertical short grip has a low-profile length for increased mobility and decreased "snag" factor. The forward angle increases the rigidity of the forearm, while providing a more natural wrist angle. Its aggressive texture and storage volume combined with modular design allows for improvements and adaptation in the future. Included is a cross bolt designed to work with improvised tools to allow for easy adjustment or re-tightening, reversible clamps which allows users to set up fasteners to reside on either side, and a spring-loaded clamps that makes installation and removal easier.